As the Rig Vedas and Buddhist sutras foretell, as well as the Hopi and Mayan calendars, we are in the midst of complete transformation�ecologically, economically, politically, culturally. This graceful introduction offers creative safe passage through the sometimes overwhelming transition, drawing on ancient and contemporary spiritual practices particularly useful for these times. The endings we experience are always the beginning of something else. 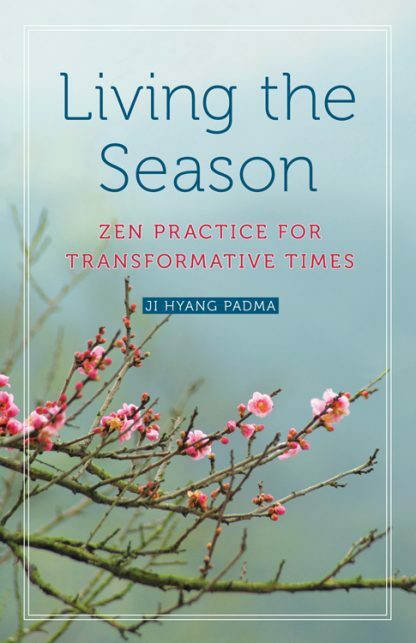 Hence author Ji Hyang Padma organizes teachings around the four seasons. In living connected to natural rhythms�the stillness of winter, the renewal of spring, the ripening of summer, the harvest of autumn�we touch a wholeness that is the source of healing and happiness. Practical exercises at the end of each chapter promote this state of being and bring the mind home to its innate clarity. Ideally suited to anyone experiencing personal change�through career, relationships, or world events�the book provides a way into Zen for beginners as well as a refresher for the more advanced. Ji Hyang Padma combines an academic career as Director of Spirituality and Education Programs at Wellesley College with her role as a Zen teacher. Ji Hyang has done intensive Zen training and teaching in Asia and North America for 20 years, 15 of these as an ordained nun. She has completed several 90-day intensive retreats in Korea and North America. She also teaches Zen workshops annually at Omega Institute and Esalen Institute. While her practice has been situated within the Korean Zen tradition, she has had the benefit of studying with teachers across a wide spectrum of Buddhist lineages. Ji Hyang has also served as Director and Abbot of Cambridge Zen Center, one of the largest Zen Centers in the country. Additionally, she has served as a meditation teacher at Wellesley College, Harvard University and Boston University. She is gifted at finding an entry-point into practice for people who are just beginning their journey. Currently Ji Hyang is completing a Ph.D. in Transpersonal Psychology at Sofia University with a research focus on Buddhist practices of healing. She serves on the board of Education as Transformation, an international organization that works with educational institutions to explore the impact of religious diversity and the role of spirituality in the learning process. Ji Hyang�s recent writing has been published in Our Neighbor's Faith: Stories of Interfaith Encounters and Arts of Contemplative Care: Pioneering Voices in Buddhist Chaplaincy and Pastoral Work.